This week, for the Wild Card Round of the playoffs, we’ll be looking at each positional grouping at each team and examining their DFS value and fantasy football upside on both DraftKings and FanDuel. Below is the look at the quarterback position. Matchups: Of the quarterbacks available on this slate, one can’t help but gravitate toward the two most expensive (Andrew Luck and Deshaun Watson). Of the available names, they’ve clearly been the best and have flashed the most upside this year. That game also has an over/under of 48.0, while all other games are within a range 41.0 and 43.0 points. The spread is close (+/- 1), implying shootout potential, and both defenses tend to funnel more production via the pass. Both will be heavily owned, so the other names have added contrarian value in tournaments, but Luck and Watson are clearly at the top of my board when contrasting salary and projections. I also like having exposure to the first game on a short slate. I’ll know very quickly where my lineups stand and how conservative or contrarian to go with the rest of my lineup. During the regular season, Watson went 1-1 against the Colts, averaging 24.7 fantasy points per game, though Luck outscored him in both games. Of the defenses available on this slate, Indianapolis ranks second-worst in schedule-adjusted fantasy points per game allowed and fantasy points allowed per dropback. Among all teams, they rank closer to average. Watson ranks top-five among all quarterbacks this year and behind only Luck (by less than 0.5 fantasy points per game) of the quarterbacks on this slate in both DraftKings and FanDuel fantasy points per game. Since Week 12, Watson is averaging a whopping 7.7 rushing attempts per game and 8.6 rushing fantasy points per game. This is what gives him, in my estimation, the highest floor and second-highest ceiling of all quarterbacks on this slate. What keeps Watson a hair below Luck in my own rankings is an injury-riddled receiving corps and a head coach who prefers to play more conservative (i.e. run-heavy) when playing with a lead. If there’s a slate-winning play at the quarterback position and it’s not Watson, it’s probably Luck. I usually like paying down at the position, but I think he still offers enough value to make him my favorite play at the position. Luck leads all slate-eligible quarterbacks in both DraftKings and FanDuel fantasy points per game. He averages 29.7 fantasy points per game across two games against Houston this year (5.0 more than Watson in those games). The Texans rank third-best among all teams in points allowed per drive, but are also a top pass-funnel defense, surrendering 75.9% of their yards via the pass (second-most). 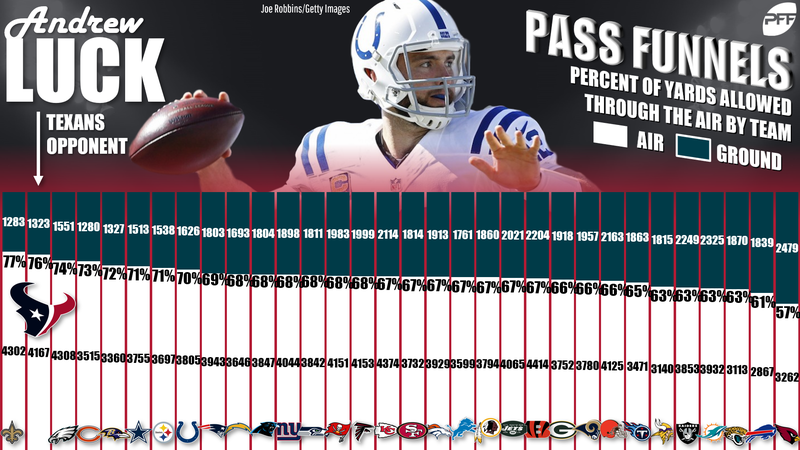 This is fine for the Colts, who have mostly been a pass funnel offense all year (fourth-most pass attempts per game). Not only is Luck the best option of these names, but he also has the best on-paper matchup. The Texans rank ninth-worst of all 32 teams (and worst on the slate) in schedule-adjusted fantasy points per game to opposing quarterbacks. Prescott is easy to sleep on, but he actually ranks fifth-best among all quarterbacks (and highest on the slate) in fantasy points per game since Week 6 (21.4). This is due in part to the acquisition of Amari Cooper as well as a more concerted effort to get Ezekiel Elliott involved in the passing game. That makes this a strong matchup for Prescott, as the Seahawks are giving up the most receiving fantasy points per game to enemy running backs and rank 10th-worst in schedule-adjusted fantasy points per game to opposing WR1s. The Cowboys have the fourth-highest implied point total of the week (just 2.0 points behind the Texans), are at home, and with shootout potential (favored by 2.0 points). Prescott is my favorite sleeper at the position, but still a tier behind Luck and Watson. Dallas’ defense has been strong this year, but they are more of a pass funnel defense, surrendering 71.3% of their yards allowed through the air (fifth-most). Ideally, this could force the 2018 (more conservative) iteration of Wilson (ninth in fantasy points, last in team pass attempts per game) into something closer to the 2017 version of Wilson who led the position in fantasy points. Otherwise, it’s hard to get excited about Wilson, who has been running less this year, while Seattle has relied more heavily on their running backs. While I won’t have much exposure to Wilson, I will spend Saturday night living in fear of Wilson posting one of his patented hyper-efficient blowup games. Trubisky ranks as only our 33rd-highest-graded quarterback this year (of 38 qualifying), but that hasn’t mattered too much for fantasy. He ranks 11th in fantasy points per game (third on this slate) and has flashed a high ceiling with three games of 30 or more fantasy points. The Bears have the second-highest implied point total of the week (23.75), favored by 6.5-points at home against the Eagles. After the Colts and Texans, the Eagles are probably the third-best matchup for any quarterback on this slate. They rank third-worst (of these defenses) in schedule-adjusted fantasy points per game, but they’re more middle of the pack overall, and there’s really not much separating them from any other team but the Ravens and Bears. Of these defenses, the Eagles have also surrendered the most rushing touchdowns (four) and the second-most rushing yards (265) to opposing quarterbacks. 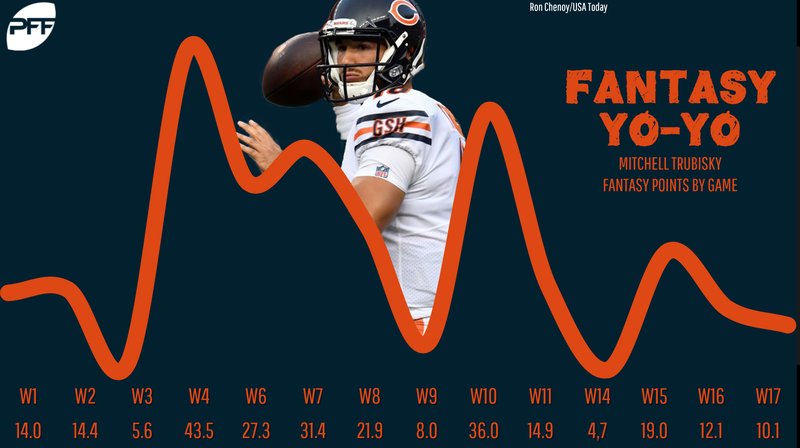 I’d say that’s good news for Trubisky, who has seen 22% of his fantasy points come on the ground, but his rushing production has mostly dried up ever since a prolific four-week stretch during the middle of the season. Trubisky has shown slate-busting upside, and there is a feeling that head coach Matt Nagy might be saving the best of his play calls for the postseason, but I’m still mostly just left with a lukewarm feeling toward Trubisky. Jackson averages 18.7 fantasy points per start, and though we haven’t really seen massive upside, he has hit at least 15.0 fantasy points in every start thus far. In Week 16 against the Chargers, Jackson walked away with the victory and 16.1 fantasy points. He totaled only 39 rushing yards on 13 attempts (his lowest output of the season), but this may have been gamescript-related, in a victory by 12 points. Jackson is averaging 0.83 fantasy points per dropback, which is a new PFF record, and 21% better than Patrick Mahomes. If the Chargers can put up points, perhaps Jackson might finally unveil his true upside. Unfortunately, that seems unlikely. Los Angeles is more susceptible to the run than the pass, and Baltimore has been running on a whopping 61% of their plays since Week 11. Still, he’s one of the better plays at the position on DraftKings. Foles and Rivers offer contrarian appeal on a short slate – no one will be playing them, so if you do and they go off, that offers a massive edge to your lineup. That said, they’ll draw low ownership for a good reason. Baltimore and Chicago are at home and have easily been the league’s toughest defenses for opposing quarterbacks. Defensive matchups are often overstated, but that’s not true at the polar extremes. While the difference between Luck’s matchup and Prescott’s is marginal, the difference between Watson’s matchup and Foles’ is massive. Both Baltimore and Chicago rank top-three in schedule-adjusted fantasy points per game, opposing passer rating, and fantasy points allowed per dropback to opposing quarterbacks.